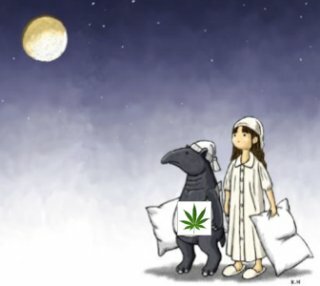 With a wild population of 2,000, a Malyan Tapir might be considered endangered, but with the mythical name of 'Baku' (BAH-koo), one wonders if this rare species might have arrived on the planet with some very unique supernatural powers? According to Japanese folklore, Baku are other-wordly creatures that were known to devour the nightmares of children and protect them from evil. Born in the Mile-High City, the Denver Zoo is celebrating the birth of an endangered Malayan tapir calf they have chosen to name Baku (BAH-koo). Born to mother, Rinny, and father, Benny, late in the evening on April 29, 2014, this little tyke is only the second birth of his species to be conceived and delivered within the confines of this zoo. Perhaps because of his supernatural powers, he will remain behind the scenes in Toyota Elephant Passage while being cared for by his mom and pop, until they are comfortable enough to allow him to venture outdoors. So, until then, visitors will only be able to view his activities by closed-circuit cam. The dream-eating abilities of Baku originated as early as the Muromachi period (14th-15th century) in Japan. In a 1791 Japanese wood-block illustration, a specifically dream-destroying Baku is depicted with an elephant’s head, tusks, and trunk, with horns and tiger’s claws. 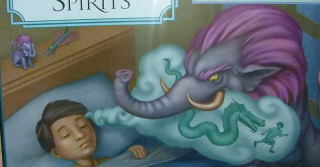 This book illustration modernizes the look of Baku as he protects a sleeping child. The real-life Baku is however more closely related to the rhinoceros species, but in appearance looks more like an over-sized pig. They sport a large, barrel shaped body ideal for crashing through dense forest vegetation. Their noses and upper lips are extended to form a long prehensile snout similar to a stubby version of an elephant’s trunk. Malayan tapirs are the largest of the four tapir species. and stand more than 3-feet-tall with the ability to stretch from 6 to 8-feet-long. On average, they weigh between 700 and 900 pounds and are considered excellent swimmers spending a good part of their day in ponds. They can even use their flexible noses as snorkels! As adults, the Malayan tapir's color pattern is sometimes referred to as that of an "Oreo cookie," with black front and back parts separated by a white or gray midsection. This provides excellent camouflage protection, breaking up the tapir’s outline in the shadows of the forest. Differing slightly, young tapirs like Baku have a spotted and striped coat which also protects them from predators. 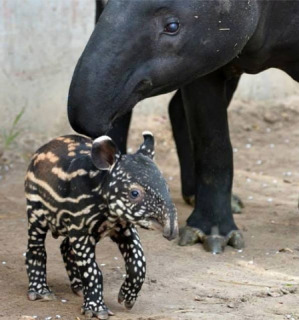 So the question remains: Will the latest member of the tapir family -- bringing them in at about 2001 existing in the world -- grow to become a "Super Tapir" warding off evil demons and protecting children while they sleep? Time will tell. He's got a lot of growing up to do. And who knows with all that rarefied air he'll be breathing, not only as a result of residing one-mile up, but also in a state where a 'Rocky Mountain High' is ubiquitous and now legal - he just might be exhibiting those super powers sooner than we think! What is a Tanuki? The Animal Video of the Day!! !